The Yellow Bell: A brief sketch of the History of Chinese Music. New York: Gordon Press, 1974. Reprint Cloth AS NEW 8vo (6-1/4 x 9-1/4), 61 pp including Bibliography. Hardbound book is FINE -- Unrmarked, Unread, and AS NEW. Red cloth with gold lettering, no DJ as issued. Reprint of the 1934 English translation of the French "La Cloche jaune." Clearly written book will be attractive and useful for anyone wanting an entree to Chinese Classical music, whether for cultural understanding or for a musician who wants to get the sense of the Chinese musical structure -- it covers the music theory the 5 and 7 tone scales, the eight sonorous bodies underlying the development of traditional instruments, moral and philosophical influences, popular song and includes the musical notation for the Chinese Opera "The Heavenly Maiden Scattering Flowers." Gift quality reprint. Dixie Lullaby: A Story of Music, Race, and New Beginnings in a new South. New York: Free Press, 2004. First Edition, First Printing 1/4 cloth AS NEW in AS NEW DJ 8vo (6-1/4 x 9-1/4), 296 pp including Index, Bibliography, and Notes on Sources. Hardbound book is FINE -- Unread, Unmarked (other than slight remainder mark) and AS NEW in AS NEW pictorial DJ. (h) Allman Brothers, ZZ Top, Leon Russell, and more, all transmuted Rock 'n Roll through their own social and cultural sensibilties into a new version of true American Folk Music -- Rock 'n Roll. The author's story-telling style is perfect coming from a man who grew up in the middle of the change. Los Angeles: Echo Park Evangelistic Association, Inc., 1920's (?). Unknown edition Cloth Good + in Wraps 12mo (5-1/4 x 7-1/2), 210 pp. Book is perfect-bound with cover of red "Art canvass." Pages are tanned with age with some chipping on the edges of a few, but all pages and present and are tight and clean, unmarked -- no writing on pages or cover. Canvas cover is complete and tight but some fraying on edges and dog-eared on corners. Still, an exceptional artifact of a long gone and historically flamboyant era. 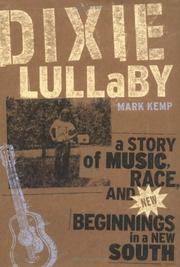 Dixie Lullaby: A Story of Music, Race, and New Beginnings in a new South (SIGNED). New York: Free Press, 2004. First Edition, First Printing 1/4 cloth AS NEW in NEAR FINE DJ 8vo (6-1/4 x 9-1/4), 296 pp including Index, Bibliography, and Notes on Sources. Hardbound book is FINE -- Unread, Unmarked (other than slight remainder mark) and AS NEW in NEARLY AS NEW pictorial DJ (small 1 inch repaired tear at bottom back of DJ. (h) Allman Brothers, ZZ Top, Leon Russell, and more, all transmuted Rock 'n Roll through their own social and cultural sensibilties into a new version of true American Folk Music -- Rock 'n Roll. The author's story-telling style is perfect coming from a man who grew up in the middle of the change. Cambridge, MASS: M.I.T. Press, 1966. First Paperback Edition, 1st Printing Pictorial Wraps FINE in VG WRAPS Almost Square 8vo (7 x 8-1/4), 276 pp. Text is Unmarked and FINE, page edge block corners slightly soiled, wraps slightly tanned with some creases, but still VG. No rips or tears or markings on either text or wraps. One of the few copies run in the first MIT printing. (h) Thoughts and writings of one of the 20th Century's geniuses -- insights on composers (Satie, Varese, Schonberg) on artists and mystics (Rauschenberg, Meister Eckhardt) on Zen and Dada and Random Chaos. The first paperback printing of a visit with the mind of one of the greats. Eurythmics in Their Own Words. London: Omnibus Press, 1984. First Edition Oversized Paperback in glossy pictorial wraps Near Fine in Wraps 4th (9 x 12), stapled softcover, approximatel;y 36 unnumbered pages with color photos on every page. Published by Omnibus Press, distributed by Cherry Lane Books(THIS IS NOT the 128-page biography that came out later that same year.) B4 This is a collector's item -- a 36-page book filled with pictures, and a fold-out large poster (of the photo on the front cover) still intact, stapled into the book. The layout consists of large photos with paragraph clips of quotes on the page, identified as either Annie or Dave, talking about everything from their roots as "The Tourists," to the sort of candid, honest-but-racist remarks promotional people are horrified to hear from British Isles stars, some things that even they might wish they hadn't said. I have seen this book is listed in many online outlets, but none of them actually have an actual copy of it.